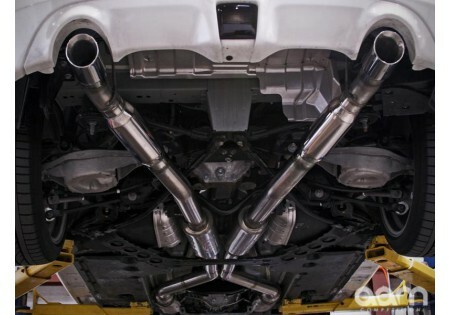 The AAM Competition 370Z R-LINE Exhaust is designed specifically to give the Z an aggressive tone, AND improve engine power. Large 3 inch piping, minimal bends, precise construction, and optimal exhaust diameter combine to produce an increase of 13 rear wheel horsepower and 14 lbs/ft of torque on the factory 370Z. The exhaust system also features a unique X Pipe design which effectively smooths and raises the power curve. The majority of the performance increase can be found between 3500 and 6500 rpm, ideal for street and track driving alike. The Nissan 370Z is a performance bred machine. It is a combination of years of Nissan's Z Car lineage, and race proven technology. Unfortunately for many, it doesn't sound the part of a sports car in factory trim. If you're one of these people, the AAM Competition 370Z R-LINE Exhaust is for you. Constructed of lightweight and durable stainless steel, the 370Z R-LINE Exhaust reduces under-hanging exhaust weight by 10 lbs versus the factory unit. The materials used to produce this exhaust system is of the highest quality, extremely resistant to corrosion, and made up entirely of 100% stainless steel.